Attorney General Bill Sorrell testifies before the Senate Committee on Government Operations Tuesday. Gov. Peter Shumlin plans to appoint independent counsel to investigate whether Attorney General Bill Sorrell broke the law. "It’s clear that there is broad consensus from members of the legislature, and the attorney general himself, that it makes sense to have these allegations reviewed independently, and the governor agrees," Shumlin spokesman Scott Coriell said Tuesday evening. The governor’s announcement came just hours after the AG made a dramatic Statehouse appearance before the Senate Committee on Government Operations. 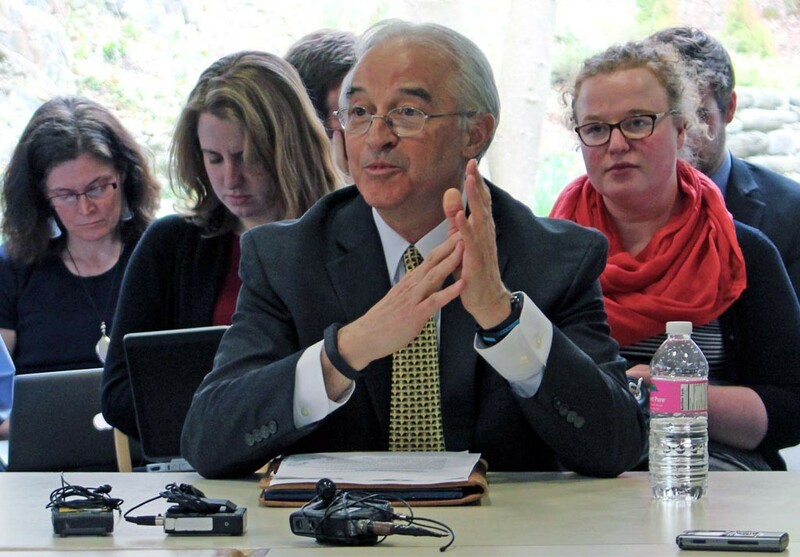 A week after shrugging off accusations that he violated campaign finance laws, a chastened Sorrell reversed course and told the committee he would welcome a formal review. Last week, Charlotte attorney Brady Toensing filed a four-part complaint with Sorrell and called on him to appoint an independent investigator. Toensing’s allegations against the AG ranged from illegal coordination with a political action committee to improper disclosure of campaign expenses to taking official action in exchange for donations. Toensing, who is vice chair of the Vermont Republican Party, based his complaint largely on Seven Days’ reporting. As he did last week, Sorrell denied the charges Tuesday. “I want to be very clear: With strict adherence to my oath of office, I have been proud and honored to serve as attorney general,” he said. In addition to Sorrell, Shumlin and the 14 state’s attorneys have the power to investigate such matters or to appoint others to do so. Department of State’s Attorneys and Sheriffs' Association executive director David Cahill told the committee that his members had voted to create a “peer review committee” to determine whether Toensing’s allegations have merit. If so, he said, the state’s attorneys would commission an investigation to review for probable cause and proceed from there. Though Cahill said the state’s attorneys would fulfill their statutory obligations, he told the committee the department lacked the funds to finance such an investigation. The committed decided to draft a letter to Shumlin asking him to appoint independent counsel. Even before the letter was composed, the governor consented. Sorrell also told the committee Tuesday that he was willing to surrender his statutory authority to investigate all other campaign finance complaints. Committee members did not immediately do so, saying that such a significant change would require further debate. But they did vote unanimously to reduce the penalties faced by publicly financed candidates who don’t comply with regulations. The change, which would apply retroactively if signed into law, would benefit 2014 lieutenant gubernatorial candidate Dean Corren. Last month, Sorrell accused Corren of improperly coordinating with the Vermont Democratic Party and sought $20,000 in fines, as well as a $52,000 reimbursement of state funds. The committee’s proposal would prevent Corren from having to repay the $52,000; instead, he’d owe the $255 he allegedly received in in-kind support from the party.